According to Bob Glauber of Newsday, John Mara, Co-Owner of the New York Giants has spoken; “There was never any doubt.” Mara was of course referring to the status of Head coach Tom Coughlin, and if he would return next season. “I believe in stability. You can’t build anything if you’re constantly making changes and firing people”, said Mara. This is one thing that many professional sports lack when they hit a rough patch, desperately looking for a way to recover and grasp onto their . I’ll use my disappointing Buffalo Bills as a prime example of this because it is so easy to. Year after year the Western New York area has been filled with false hope for the past decade. The Bills have mowed through 5 different head coaches in the past 10 years, not including this year’s head coach, Chan Gailey. In these past 10 years the Bills overall record was 66-94. During none of these years were the Bills blessed with a guaranteed starting quarterback for any season. It almost felt as though every year the Bills were on the edge of something by playing hard, but would fall apart due to injuries, coaching mistakes, and simply not having enough talent. The truth is that the instability in within the desperate Bills organization has held them back. This year the New York Giants went 10-6, and were squeezed out of the playoff picture. 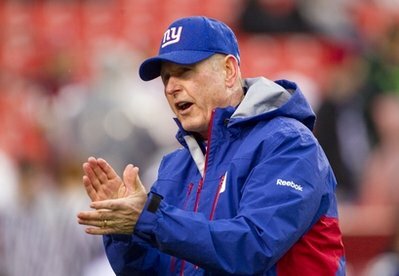 Tom Coughlin’s overall record as Head Coach of the Giants is 65-47 which equals a .580 win percentage. The last coach of the G-Men to compile a better record in his tenure was Bill Parcells who was 77-49, which is equivalent to a .611 win percentage. The point is that this year was not an unsuccessful year. Yes, New York’s Football Giants failed to make the playoffs for the second consecutive year, the pressure will be on Tom to prevail next year. However, the majority of “experts” predicted that the Giants would finish 2nd or worse in the division, many besides ESPN’s analysts thought it would be another 8-8 season. The truth is, when you have a centerpiece as important to your organization as Coughlin has been, whether its his record or the 2007 Super Bowl win, you do not simply let that stability and reliability fly out the door. I understand that New York City is a place full of desire and emotions, but its time to look closely at your situation and be thankful for what you have in your football team. 2011 looks promising for the New York Football Giants.